It was a hot day in Seville, but the cool gardens of the AlcÃ¡zar provided a welcome oasis in the city. As I walked along the intricately ornate corridors and the lush gardens, I tried to imagine the life and the rule of King Pedro I the Cruel of Castile in the 14th centuries. Have you visited any Moorish influenced palace, castle, or fortress before? Do you wish to visit them? How do you like them? I think they are extraordinary! Beautiful and intricate. Alhambra in Granada and the Castle of the Moors in Sintra are other exceptional great examples. Share your story here! 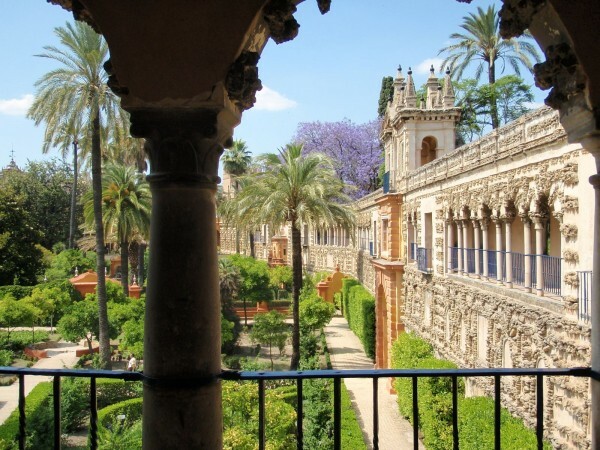 What’s happening in Seville this month? Seville’s April Fair! I also just really loved Seville. Did you visit Italica when you were there? It’s some Roman ruins about 30 minutes outside of town, and was totally amazing because we practically had the place to ourselves. .-= Ashley´s last blog ..The Cherry Blossom Festival =-. Hi, just discovered your blog! Like it a lot! Hope to follow you guys in your travels. I love Sevilla and Granada both! Unfortunately, the last time I was there was 1996 – the pre-digital era, so I don’t have many photos to show. But Moorish architecture and culture fascinates me! .-= Jen Laceda´s last blog ..A New Phase… =-. Hi Jen, I’m happy that you find us I’ve been following your blog for a while, great blog you have! They are so great aren’t they, the Moorish castles.. So intricate.. I hope in the future I will see more of them. Where are you about right now? We absolutely loved our visit to Sintra. We even made a video about it. I love the Moorish architecture! We loved how you could climb around on the pretty much untouched castle. There are no railings, ramps, or new stairs. It’s great fun! Hey Kim! Thanks for finding us Lovely website you have there. We love Sintra too, and I do remember clambering up in the steep staircase without railing Lovely Sintra video!